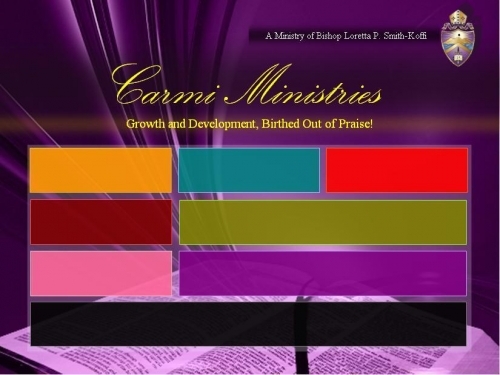 Carmi Ministries is a Bible-based, worship-centered ministry system dedicated to developing dynamic and effective leaders within the Kingdom community. We are committed to building people into the dimension of the Spirit through comprehensive exposure to cutting-edge truths and principles and engaging them in a new way of thinking that enables ministry transitioning. The training programs are designed to yield the practice and experience of apostolic kingdom ministry. Carmi Ministries exists to continually feel the heartbeat of God and provide structured exposure to current truths affecting the body of Christ. To assist in the growth of the leadership and laity within the body of Christ. Using workshops, conferences, printed material, and other such mediums, we will provide opportunities for the family of God to be strengthened for the end time work of the kingdom.